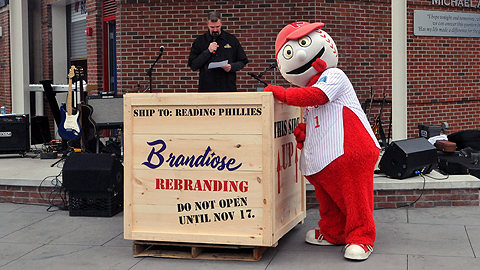 (Reading, Pa.)---As part of its rebranding process, the Reading Phillies, Double-A affiliate of the Philadelphia Phillies, announced on Sunday that the franchise would be changing its team name after 46 years. The franchise's new name, logo, and jerseys will be unveiled at 12:30 p.m. on Saturday, November 17th at the Name Change Announcement to be held at FirstEnergy Stadium. The event will run 11:30 a.m. to 1:30 p.m.
"Since 1967, the Reading Phillies have been proud affiliates of the Philadelphia Phillies," said Reading General Manager Scott Hunsicker. "Our relationship is the longest affiliation in the minor leagues and there has never been a better time to be a Phillies affiliate.. Considering the heritage and fun nature of Baseballtown, our entire front office is extremely anxious to unveil and share our new name with everyone on November 17th." Fans will have the chance to be the first to find out the new name and rebranding information by signing up for the newly-launched Baseballtown Insider. The Baseballtown Insider is catered to fans who want to receive breaking news about everything Baseballtown before it is released to anyone outside the organization. Subscribers to the newsletter will also receive special discounts and additional perks just for signing up. Those interested can register here Reading Phillies New Team Name. Members of the Baseballtown Insider will receive the rebranding details prior to being announced at the event on November 17th. In addition, only Baseballtown Insiders will be invited to the Name Change Announcement. The Name Change Announcement will be held in VIST Bank Plaza at FirstEnergy Stadium on Saturday, November 17th and is only open to those who subscribe to the Baseballtown Insider. Additionally, members of the newsletter will receive FREE hot dogs, hot chocolate, and soda throughout the event. Announced in late October, Reading's rebranding will be handled by sports marketing firm Brandiose. Based in San Diego, California, Brandiose has dreamt up unique team names, mascots, and looks across Minor League Baseball. They have designed the logos for the Harrisburg Senators, Lehigh Valley IronPigs, and Richmond Flying Squirrels as well as reimagining the look of the Cincinnati Reds, America's oldest baseball club. The Reading Phillies and Philadelphia Phillies continue their long-standing affiliation when the team opens up its home season on April 12th against the Erie SeaWolves at FirstEnergy Stadium. Season ticket and mini-plans for the 2013 season can be purchased online at RPhils.com, by phone at 610-370-BALL, and in-person by visiting the R-Phils Ticket Office at FirstEnergy Stadium.